Scene from last year’s Sun Valley Harvest Festival. For story, schedule, see C8. Photo by Paulette Phlipot. The Sun Valley air will be thick with delicious smells this weekend as the second annual Sun Valley Harvest Festival gets underway. This seasonal celebration of local cuisine and culinary expertise features local, regional and celebrity chefs, as well as regionally sourced food, wine, beer and spirits. 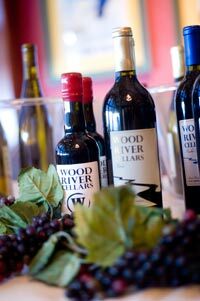 The event will focus on sustainable cuisine and responsible culinary practices, and celebrate the epicurean beauty of the Wood River Valley as the seasons begin their shift from summer to fall. Highlights this year include Top Chef semi-finalists Sam Talbot and Dave Martin. Talbot and Martin will participate in the Harvest Festival's cooking demonstrations, when they will display their signature cooking techniques using organic, Idaho-grown ingredients while sharing tips and speaking about their experiences. A variety of visiting chefs will also participate in the cooking demonstrations, including Clay Conley of Buccan in Palm Beach, Melissa Costello of Karma Chow in Los Angeles and Cathy Whims of Nostrana in Portland. Local chefs participating the in the demonstrations will include Chris and Rebecca Kastner of CK's Real Food in Hailey, Taite Pearson of Della Mano in Ketchum and Judith McQueen of Judith McQueen Entertaining in Hailey. In addition to hosting demonstrations by talented and critically acclaimed chefs, the festival partnered with a variety of local restaurants for Friday's Restaurant Walk, sponsored by Sysco Idaho, and for the Saturday Harvest Dinner, giving local talent the opportunity to display their finest culinary efforts for sampling, using regional and seasonal ingredients. Regional beer and wine will be paired with various dishes as well. The Sun Valley Harvest Festival's full weekend of events will also feature a Martini and Caviar Party with Chef Clay Conley of Buccan, who will prepare Idaho caviar from Tsar Nicoulai in unique and innovative ways while a master mixologist creates innovative cocktails with a modern twist with Square One Organic Vodka, made in Idaho. The fun continues on Sunday morning as Idaho river guides compete for the title of the Idaho River's Top Cook. They will demonstrate Dutch oven and outdoor grilling techniques using Snake River Farms beef and pork. Samples will be available afterward. The Red Sky Tasting benefiting the Make-A-Wish Foundation of Idaho will round out the weekend. Samples of local and regional food will be supplied by Atkinsons' Market with Idaho's Bounty and will be prepared by a host of local chefs. Beer, regional wines and distilled spirits will also be available from Idaho distributors for tasting. For more information about the Sun Valley Harvest Festival, or to purchase tickets ranging from individual events to all access passes, visit the festival website at www.SunValleyHarvestFestival.com. Saturday, Sept. 24, Under the tent at Carol's Dollar Mountain Lodge. *All events require a ticket unless otherwise indicated. For details call 208-450-6430 or visit www.sunvalleyharvestfestival.com. Also Friday, Sept. 23, Zenergy Health Club & Spa is hosting Chef Melissa Costello for "Eating and Living the Whole Foods Way." The celebrity vegetarian and vegan master chef will share recipes and tips free of charge at noon in the lobby of the club at Thunder Spring in Ketchum.